Crave Fishbar features a largely organic and biodynamic wine list and tries to source many ingredients locally and seasonally. Its décor is composed of salvaged materials from the former restaurant, which was destroyed in a crane accident, and their custom made tables and chairs were created from recycled materials at Recycled Brooklyn. 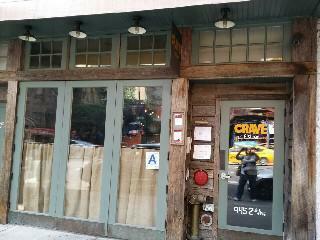 Crave Fishbar participates in Sustainable Seafood Week NYC, showcasing locally and sustainably caught seafood dishes.